Final battle of the Haitian revolution. July 14 is Bastille Day. On that date in 1789 tens of thousands of poor people in Paris attacked a hated prison called the Bastille and began the French Revolution. The continual intervention of poor people in the cities and countryside — particularly in Paris — drove the revolution forward. Even the terms “left” and “right” derive from the French upheaval. When the National Assembly met in 1789, the supporters of the king seized the right portion of the chamber and forced revolutionaries to sit on the left. They did this because of an ancient prejudice against left-handed people. The French Revolution started in Europe, but it belongs to the world. And there would have been no French Revolution without Haiti. The French Revolution was a capitalist, or bourgeois, revolution. It swept away all the old feudal rubbish, like the remnants of serfdom, that oppressed people. Even the formation of a national market, a necessity for capitalism, had to be fought for. The capitalist class or bourgeoisie was not a new class. It began its rise centuries earlier in merchant trading. Its earliest attempts to challenge the old feudal order, usually under the guise of religious differences, were thrown back with bloody reprisals. The Bourbon kings and the big nobles of France were aristocratic parasites who feasted while millions lived in rags. They were symbolized by Queen Marie Antoinette, who, when informed that people had no bread, exclaimed, “Let them eat cake!” referring to the burnt remnants of bread caked inside communal ovens. During the 1700s, the Bourbon monarchy was increasingly challenged by the bourgeoisie. Its ideologues, led by Voltaire, questioned everything and led the great intellectual movement known as the Enlightenment. Voltaire campaigned against executing people on “the wheel,” a torture device to which people were tied while their bodies were broken, sometimes just for allegedly mocking a religious procession. But what gave the bourgeoisie its newfound confidence to oppose the monarchy were the profits flowing into its coffers from the labor of people held in slavery. The livelihood of 2 to 6 million people in France — out of a total population of 25 million — depended on slavery and products grown by enslaved people. French possession of Haiti meant it owned the richest colony in the world. Its trade employed 24,000 French sailors on 750 ships. While Britain had an export trade of 27 million British pounds, the French were close behind with 17 million. The wealth produced by the Haitian people in slavery accounted for nearly 11 million pounds alone. The French bourgeoisie declared “Liberty, Equality, Fraternity” as the watchwords of their revolution. This is still the motto of France today. But most French capitalists never wanted to abolish slavery or to grant liberty to Black people kidnapped from Africa who were worked to death in Haiti, Guadeloupe and Martinique. At that time conditions were such in Haiti that the average life expectancy for a Black person on the island was 21 years. Then, news of the French Revolution reached Haiti and created a political ferment as it became known to people in slavery. Dutty Boukman, an African originally enslaved in Jamaica, started a revolt in August 1791. Over 1,800 plantations were burned. Boukman was eventually killed, bravely fighting. But new leaders like Toussaint Louverture and Jean-Jacques Dessalines arose. The rising of Haiti’s enslaved people could not be stopped, and it found support among the French poor. 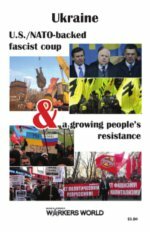 While the French Revolution was a bourgeois revolution, it was poor people in the cities and countryside who fought for it. In Europe, there was as yet no modern working class because there were no big industries. The Industrial Revolution had just started in Britain a few years before with the first cotton spinning machines. The French poor hated aristocrats and royalty like Marie Antoinette. But it was the “aristocracy of the skin,” as it became known, that became the most hated. Poor people in Paris found it detestable that people could be enslaved, branded and sold like cattle just because of their skin color. James wrote, “In these few months of their nearest approach to power [the French poor] did not forget the Blacks. They felt towards them as brothers, and the old slave-owners, whom they knew to be supporters of the counter-revolution, they hated as if Frenchmen themselves had suffered under the whip. As the French Revolution went forward, those bourgeois political leaders who opposed radical measures became known as Girondists. They were named for the region surrounding the French port of Bordeaux. Like Liverpool in England, Bordeaux’s economic life depended on the slave trade. But most of the Girondist leaders who talked so grandly about liberty didn’t want to abolish slavery. It was only when Robespierre and the radical Jacobins were in power that slavery was formally ended in all French possessions by the decree of Feb. 4, 1794. This was a historic measure by France’s National Convention, but it only confirmed the freedom that had already been seized by the enslaved people themselves. The French Revolution was opposed by all of feudal Europe and by Britain, its commercial rival. Like the Russian Revolution more than a century later, France was invaded on a dozen fronts. The Duke of Brunswick, commander of the Allied Army (principally Austrian and Prussian), issued a manifesto threatening the destruction of Paris. Although Britain bankrolled some of the armies invading France, its own army was absent. That’s because it was invading Haiti. This move was a disaster for the British ruling class. “By the end of 1796, after three years of war, the British had lost in the West Indies 80,000 soldiers including 40,000 actually dead,” wrote James. If the British army that invaded Haiti had marched on Paris along with other European powers, the French Revolution might have been crushed. 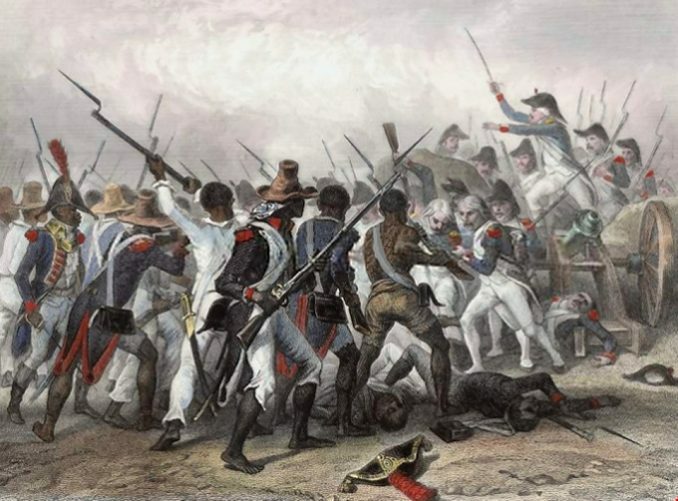 By defending their own freedom in a battle with British invaders, the Haitian people also defended the freedom of 25 million people in France. After the French Revolution, the radical Jacobins were overthrown and many were executed. Napoleon Bonaparte eventually seized power and became a military dictator. Napoleon defeated one European feudal army after another. But he couldn’t conquer Haiti. Napoleon sent an army to Haiti commanded by his brother-in-law, Charles Leclerc, and Toussaint Louverture was kidnapped and died in a French prison. Despite massacres that included drowning a thousand Black people at a time, as well as public burnings and hangings, the French army suffered a worse defeat than the British. Out of 34,000 French troops, 24,000 died. Dessalines declared Haiti’s independence on Jan. 1, 1804. But the world capitalist class has never forgiven Haiti for its revolution. U.S. slave masters had nightmares about leaders in the mold of Dessalines, like Nat Turner who led an 1831 uprising of enslaved people in Virginia. Haiti is still deliberately kept the poorest country in this hemisphere by the United States and other capitalist countries. But the Haitian Revolution changed history forever. French capitalists use Bastille Day to glorify French colonialism. But socialist revolutionaries should celebrate Bastille Day by demanding that the more than 2 million prisoners locked up in U.S. bastilles be freed, starting with Leonard Peltier, Mumia Abu-Jamal, Dr. Aafia Siddiqui and the MOVE 9. Bastille Day should also be celebrated because of the Iraqi Revolution that overthrew the U.S.- and British-backed monarchy on Bastille Day — July 14, 1958. Capitalists never forgave Haiti’s revolution and haven’t forgiven Iraq’s people for taking over their own oil. The Pentagon has invaded Iraq twice and still occupies it. The U.S. capitalist class is as obsolete and useless as the French aristocracy was 228 years ago. Capitalists want to take away health care, privatize Social Security and cut wages even further. A socialist revolution is needed just to stop capitalism from cooking the earth. The multinational working class in the United States will be forced to rise, as the French and Haitian masses did. An absolutely necessary requirement for success is that millions of white workers, part of this multinational class, break with racism. They need to see, and will see, that they are being used as political cattle by the wealthy and powerful, like Donald Trump, who actually despise them. Tear down the Bastilles! Down with the aristocracy of the skin! Reparations for Haiti!